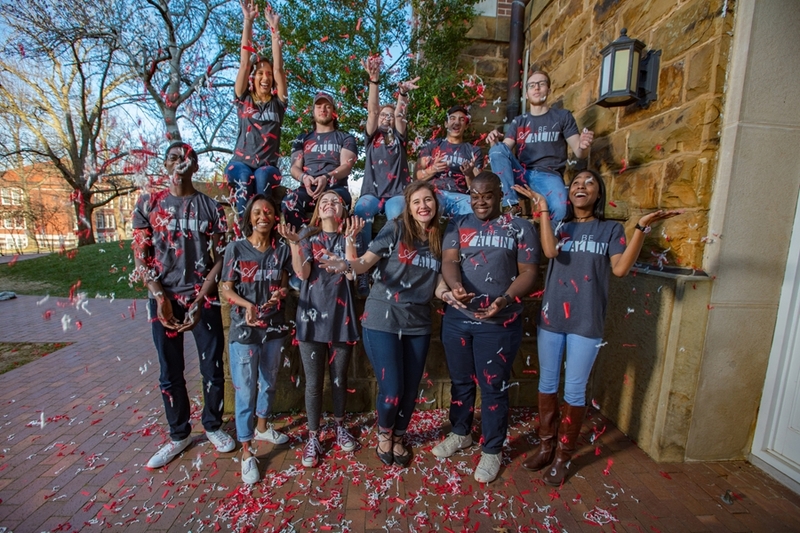 Students celebrate the successful conclusion of All In for Arkansas, the university's second annual giving day. The university raised $134.2 million in private gift support in fiscal year 2017 and pushed its Campaign Arkansas total past $650 million. FAYETTEVILLE, Ark. – For the seventh year in a row, the University of Arkansas raised more than $100 million in private gift support for students, faculty and staff, capital projects and programs. The 2017 fiscal year ended with an impressive $134.2 million in private gift support, slightly outpacing 2016 and making it the third-best year in the university’s fundraising history. The amount of private gift support surpassed the university’s goal of $125 million and included gifts of cash, gifts-in-kind, planned gifts and new pledges to the university received from July 1, 2016, through June 30, 2017. This amount brings the total raised for Campaign Arkansas to $657.1 million. Campaign Arkansas is an eight-year comprehensive fundraising campaign focused on advancing academic opportunity at the university. The goal of the campaign is to raise $1 billion by June 30, 2020. “This fall, we will roll out our strategic plan for the campus, and Campaign Arkansas will help us meet the goals identified in that plan,” said Chancellor Joe Steinmetz. “The campaign is a very important part of this process and is critical to our ability to increase access for more Arkansans, offer the best faculty for our students and provide them with innovative programs for their academic experience. “Student success has emerged as one of our signature strategic objectives,” said Steinmetz. “This continues to be very important for Campaign Arkansas, since the Advance Arkansas scholarship initiative is one of our priorities. This fall, we will award scholarships to our first recipients. We look forward to seeing this program grow and welcoming more Arkansans to the state’s flagship institution. “We are grateful to all our benefactors for stepping forward to help make a difference on our campus,” he said. Or check out all the articles about giving in our news archives. Support for students and programs accounted for 40 percent of the money raised, 38 percent provided for capital improvements, 19 percent supported faculty and staff and 3 percent supported other initiatives. Approximately $14 million of the total amount raised was allocated for endowed funds and will add to the university’s overall endowment total. Gifts from individuals such as alumni, friends, parents, faculty and staff made up 32 percent of the $134.2 million raised during the 2017 fiscal year. Another 39 percent came from corporations, while 19 percent came from foundations and 10 percent came from other organizations, including trusts and estates. All private gifts to the university are designated and allocated for specific purposes set forth by each donor and used solely for those purposes. The university makes every effort to align donors’ giving interests with campus priorities. Cash receipts, which include pledge payments, outright gifts and estate and planned gift distributions, reached $109.6 million in fiscal year 2017. The campus brought in a record-setting 103,156 outright gifts and new pledges from 53,196 benefactors during the fiscal year. Campaign Arkansas was launched to the public last fall with a goal of $1 billion. Alumnus Doug McMillon and his wife, Shelley, are leading the campaign as co-chairs through June 30, 2018. “Shelley and I are very excited to see the impact the campaign is already making on the University of Arkansas,” said Doug McMillon, chief executive officer of Walmart. “We’ve seen firsthand how our investments have been used to foster student success and innovative interdisciplinary programs.